One of the very first things now a day people used on their mobile phone is Facebook. So it’s the concern of everyone to make it easier to use the Facebook. And the best way to do it is built a nice Facebook app for mobile. 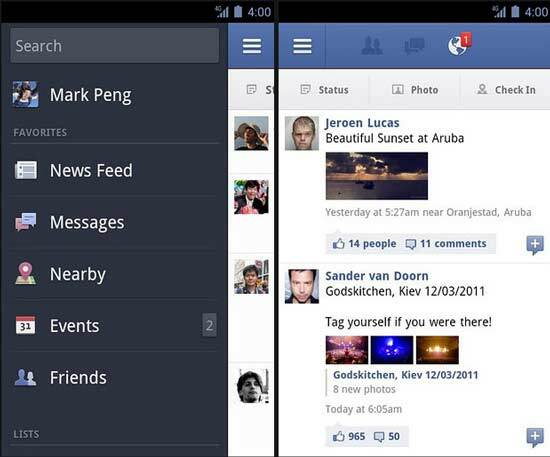 Though Android Market has a Facebook app for a very long time but many people think it need an upgrade. At last the updated version of the Facebook app has finally hit the Android Market. With this new update, Facebook has introduced a new UI that should make your life a lot easier. The new app also makes loading photos and albums twice as fast. They have also made it easier to share photos, view comments and edit captions through the app. You can now get real time push notification. There is now a bar at the top with that, just like the Facebook website, which gives you quick access to your friend’s requests, messages and notifications. Another new feature is a left-hand menu that slides in from the side to give you quick access to your favorites, lists and the search bar. To download the new Facebook app, visit the Android Market app on your phone or click this link pointing Android Market for PC.